This page has a total of 10 images, as of 28.03.2019 (21:56:09). This is a great view of the massive Shaft Structure of the Mary McKinney Mine, here marked as Mary McKinney Mining Company, but one also see part of their Coal House at the right-hand side and even their Office can be glimpsed at the right-hand edge with its darker sidewall and a single window visible. Looking at the structure it has had some years to it as the roof is starting to look not that nice. Of other things to mentioned, the Ore-House of the Anaconda Mine is visible about 1/7 in from right-hand side and about halfway up from bottom, with the until not too many years ago Blacksmith Structure partly visible behind it and covered to much by the smokestack of the Coal House of the Mary McKinney. The Roadbed of the Midland Terminal is also just behind the Anaconda Orehouse, while the Low Line roadbed can be seen about 1/5 down from the top in upper right area. The High Line/Short Line grade up Gold Hill is also partly visible almost into the sky area, also in upper right area. In the foreground some M.T. railroad Gondola cars are visible, but the only one I feel I see number off is the one most to the left which is numbered 171, which appeared quite nice on my 1200dpi scan. This is the third crop edition of this photograph by Young, not sure if the source image is of better quality, but this postcard is not the best and the 1200dpi resolution scan kinda shows it as nothing is really sharp. Mary McKinney Mine Cripple Creek-Victor Road. This view is from along the Victor-Cripple Creek road, running on the former roadbed of the Florence & Cripple Creek, looking towards the Mary McKinney Mine about center sideways and its huge crib-wall. If one could have walked into the view and hitched a ride with the automobile seen one would have ended up in Cripple Creek. The Hill in distance left-hand side is part of Gold Hill, and I wonder if part of the old Short Line roadbed is visible up there near the skyline. I can't sadly see anything though in a high-resolution scan of 1200dpi, as there is just too much blur, and overall the whole card is sadly not in a good shape due to someone at some time in the past having spilled something over it. My Website; Postcards Overview: ⊞ Mary McKinney Mine Cripple Creek-Victor Road. I've seen this image used three times, for this card and another postcard where there are a couple of extra millimeters visible on the right-hand side, plus I've seen it used in a postcard folder. The view is from the railroad side of the Mary McKinney mine, showing several box cars parked on sidings nearby and at the mine itself. It also shows part of Anaconda at right-hand side about 1/3 up from bottom, the part that survived the 1904 fire, as I see no signs of structures at left side of image, and I believe there should been visible something there if the town was still there. The tracks in the foreground belong to the Midland Terminal, but the Mary McKinney mine was once served by dual gauge as the F. & C.C was also having a spur to the mine, entering in from left-hand side, running parallel with the Shaft House to serve that and the coal bins at the power plant seen with all those smokestacks to the right of the shaft-house. Behind the smokestacks of the Power House of the Mary McKinney you can see the Ore House of the Anaconda Mine, located down by the F. & C.C. yard in Anaconda, but image is too bad to really make out any details. Which is sad, as up on Gold Hill seen in the background, there is seen the Shaft House of the Anchoria-Leland about 1/4 in from right-hand side and about same from top, with the Ore-House and trestle of the Lexington Mine seen just to the right of the Anchoria-Leland. Or even more sad, there is visible a mill on the hill side above the Low Line grade, seen about 1/3 down from top and 1/7 in from right-hand side, a mill I believe might be known as Anaconda Mill, but I might be mistaken where that mill was located as info been a little scarce, but it fit the location of west slope Gold Hill. no. 4; Souvenir Postcard Folder called VICTOR and CRIPPLE CREEK DISTRICT Souvenir Folder - "Greatest Gold Camp on Earth" - Published in ????. Postcard; Published by H.H.T. Co.; Numbered 574, titled Mary McKinney Mine, Victor, Colorado - Published in ????. 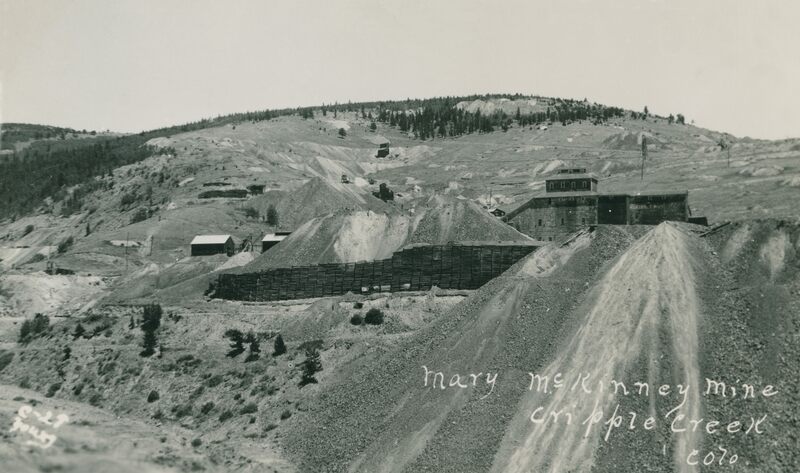 Mary McKinney Mine, Cripple Creek, Colo. This is not the best view of this area, due to the print type of process behind this postcard. It will never scan well and details are lost to the dots making up the image. But, it does show yet another image that at least at one time did exist out there as a negative, with several mines visible. Also, we see what appears to still be left standing two structures down in what once was the town of Anaconda – seen about center nearly at bottom edge – one with a false front type towards left. * In the foreground, along bottom part, is structures belonging to the Anaconda Mine, I think the long surviving Blacksmith shed is the one at lower right-hand corner. * The Mary McKinney Mine is seen about 1/3 down from top and covers about the left part of this image, from center where the large/massive Shaft House is seen with its big dump and large crib-wall down towards the road that used to be the F. & C.C. roadbed. * The Katinka Mine, often seen named as the Chicken Hawk Mine – even if most of the Chicken Hawk claim is as far as I can tell on the other side of Guyot Hill – is seen about 1/3 in from right-hand side quite near top of the card with the top of Guyot Hill behind it. It possible may also lay on another claim, but at time of writing [29.05.2017] I just go with what my old USGS map with numbered mines on them gives me of info, one day I may learn more/better info and will fix it then. * Not sure what mining operation is seen above the Mary McKinney and to the left of the Katinka, may be same mine operation, some other mine, so, for time being, I just leave it be. Postcard; Published by Auburn Post Card Manufacturing Company; titled Mary McKinney Mine, Cripple Creek, Colo. - Published in ????. My Website: ⊞ Postcards Overview; Mary McKinney Mine, Cripple Creek, Colo. 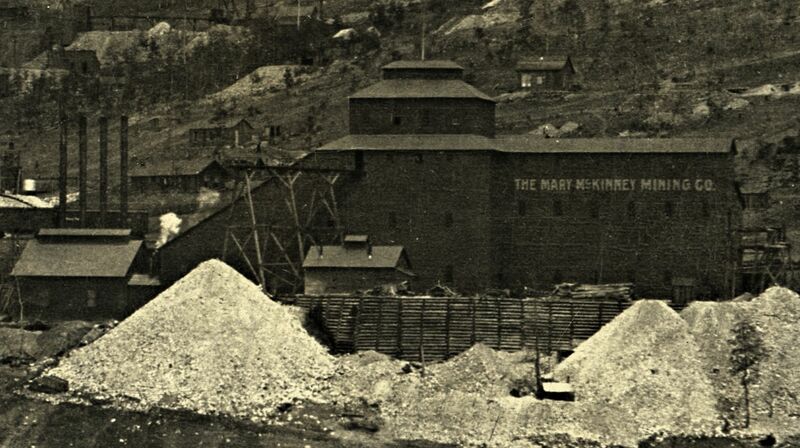 This image is showing the great Mary McKinney mine in Anaconda with lot of railroad traffic in front of. It shows the business side of the mine in terms of where the coal is brought in for power the mine, and where ore is taken away. Both in and out uses boxcars, the power plant is seen at lower right, with a string of boxcars in front of it. Further on another 3 boxcars are put up to load ore from the mine plant itself, along a spur that used to be dual gauged as both the M.T and the F. & C.C. used this spur to serve this mine. After the closing of the narrow gauge this spur was used to get access down to the El Paso mine way outside the view to the left. Town of Anaconda would have been down the valley at right. Also, in front left another side spur of the M.T. is used to load more boxcars with ore from surrounding mines on Guyot Hill via transfers from horse pulled ore-wagons – which would have been the way most of the mines did transport their ores to the railroads. My Collection; From a Postcard type of folder named The Greatest Gold Camp on Earth. Souvenir Folding Card of Cripple Creek District. Page 79; Forgotten Men of Cripple Creek; Leslie Doyle Spell; Copyright 1959 - Published in 1959. My Website: ⊞ Album; Mary McKinney Mine, Cripple Creek District. My Website: ⊞ Album; Mary McKinney Mine, Cripple Creek, Colo.
My Website: ⊞ Postcards Overview; #51. Mary McKinney Mine - Cripple Creek District. 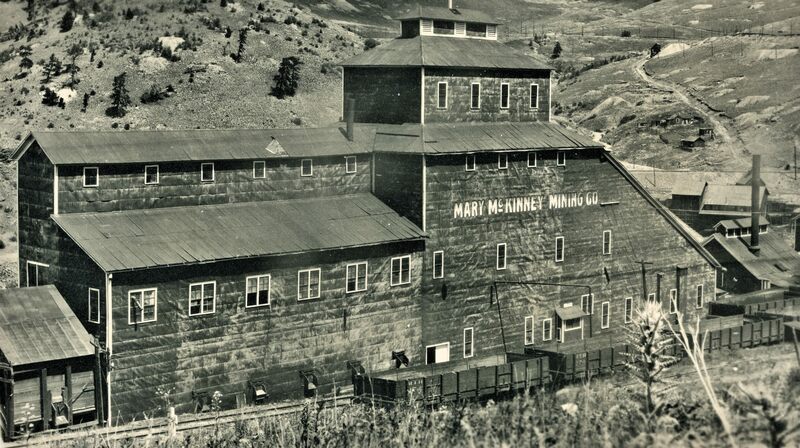 Mary McKinney Mine, Cripple Creek District, Colo. Sadly, this view is not a good quality view, neither on this card or the other postcard I've seen used for from the source negative by O.E. Masters. No date is given with this view, and I can't tell if there are dual gauge tracks or not along the mine structure, but I see several boxcars on the M.T. siding opposite the mine so the view is at least while the railroad is still active in the District. There is a Franklin 1-cent Green Stamp on the backside, but no postmark, neither any writings on the card so no date help there either. Postcard; unknown publisher; titled Mary McKinnie Mine below the image, nearly identical to this view. - Published in ????. My Website: ⊞ Postcards Overview; Mary McKinney Mine, Cripple Creek District, Colo. This view from August 1928 is not the best view I've seen, but being dated it do help tell how this area looked at that date in time, and that is always nice. 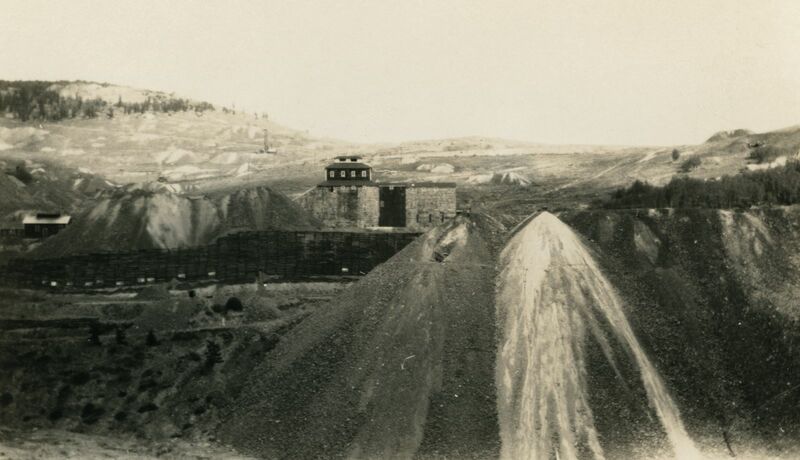 The photographer took this view looking south across Squaw Gulch towards the Huge dumps of the Mary McKinney Mine, seen behind the dump, the Crib-Wall, and with Raven Hill making up the background left. There are smaller dumps on Raven Hill, and one single head frame is seen, not fully sure which mine this was part of, I know the Work Company mines was in this area, but this mine head frame name escapes me at this time. This image I've also found on the Internet at the Wyoming State Archives Photo Collection, dated as 1903 and photo by J.E. Stimson, which was a photographer of Cheyenne, Wyoming it seems. Sadly, that image is a thumbnail type only but to my eyes they are identical. 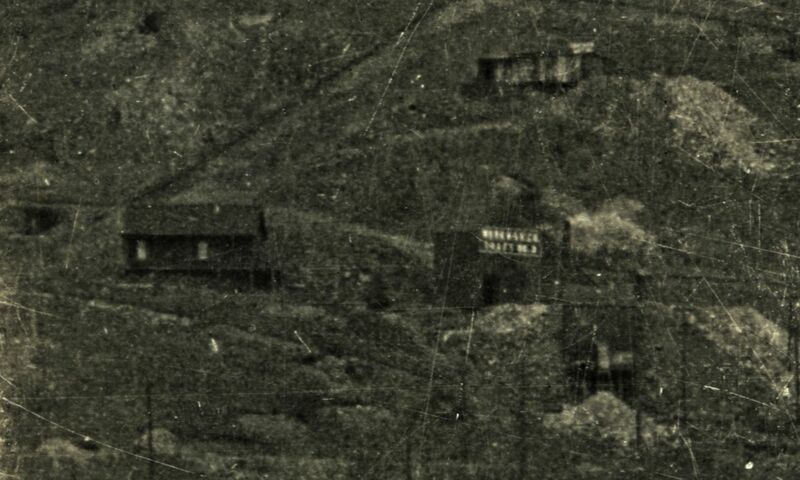 The view itself is of a printed bad quality type showing a birds-eye view from Gold Hill across Squaw Gulch with partly seen Anaconda at lower right corner and the immense mining operations of the Mary McKinney Mine seen further to the left, still along the bottom part of the image. Guyot Hill is seen just beyond from the mine, where the Chickenhawk mine is seen near the top – or at least what I know from modern times as the Chicken Hawk mine. My Collection; From page 646 in the December 31, 1904 issue of The Mining World; scaled from a 600dpi scan. Page 646; The Mining World (Volume 21, No. 27) - Published in 1904. Card has a bad curve to it making it a little bit hard to scan as it will not lay flat. Also, while this image is copyrighted 1901, it can't be photographed that year as there are no sign of the Low Line grade which was built in 1900, but an email friend told me that the F. &. C.C. Boxcars and the 4-6-0 locomotive was starting to get delivered from April 1899, hence this view has a narrow timeframe to it, but it still is not a 1901 image, more summer 1899 possible. One of the most compelling evidences to me for it not being a 1901 or even a 1900 age image is the fact there is just no signs of the Mary McKinney crib-wall along the F. & C.C. roadbed. The one that is in this view is further up, closer to the mine itself. Comparing that to an image (DB-ID#145) I have from a different angle showing the Low Line roadbed without tracks on it, dating that one to 1900 as that is the year the Low Line was built (By September 1900 rails had reached Victor), where there is indeed the Cribbing further downhill along the railroad grade, I must date this to be at some unknown time before that time, and I would think Summer 1899 is a good date to have as a base-line. The most prominent mine seen here is the Mary McKinney, just uphill from the F. & C.C. train seen about middle of view. Town of Anaconda is partly seen at bottom of view, while Raven Hill makes up the background with several mines seen. From an early Morning Glory mine, seen about 1/3 down on the image part and just right from the left-hand side of the image part, to structures belonging to the Jack Pot, the Doctor and the Ingham mines, plus several other shaft structures of the Work Company. Sadly, view is not the sharpest and best around so details are not easy to get out.